2. We will hold the property for 14 days until receipt of your booking form and deposit – 25% of accommodation cost or £50, whichever is greater. The booking form can be printed off here (click) or is available direct from us. Please note: the deposit is non refundable. 3. 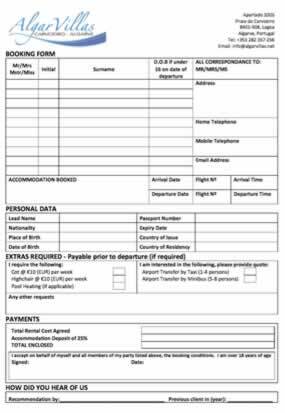 On receipt of your booking form and deposit, we will send you a booking confirmation and holiday invoice, detailing your account and intimating the balance is due 10 weeks prior to departure. © 2017 AlgarVillas.net. All Rights Reserved.